This is from the free pattern in Issue 13 of Love Sewing. 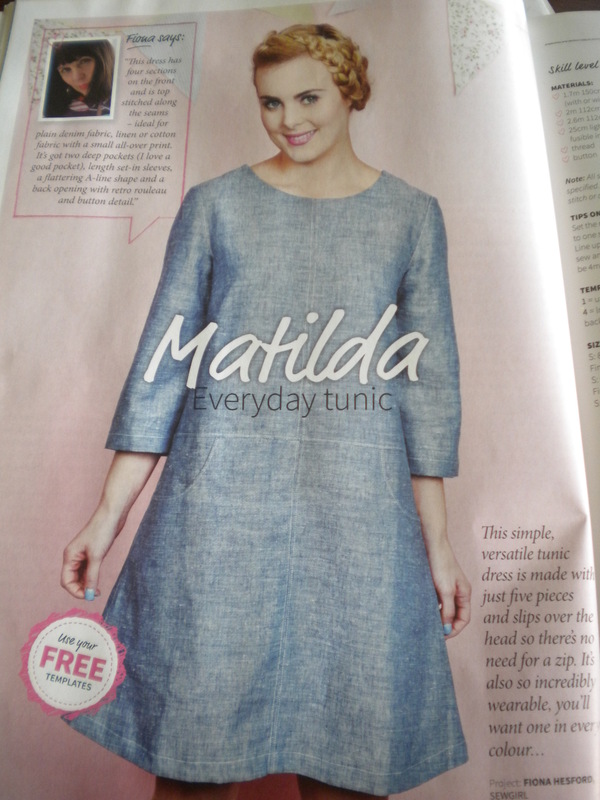 It’s the Matilda tunic from sewgirl.co.uk. There is no link there, because actually, the pattern is not on the Sewgirl website. 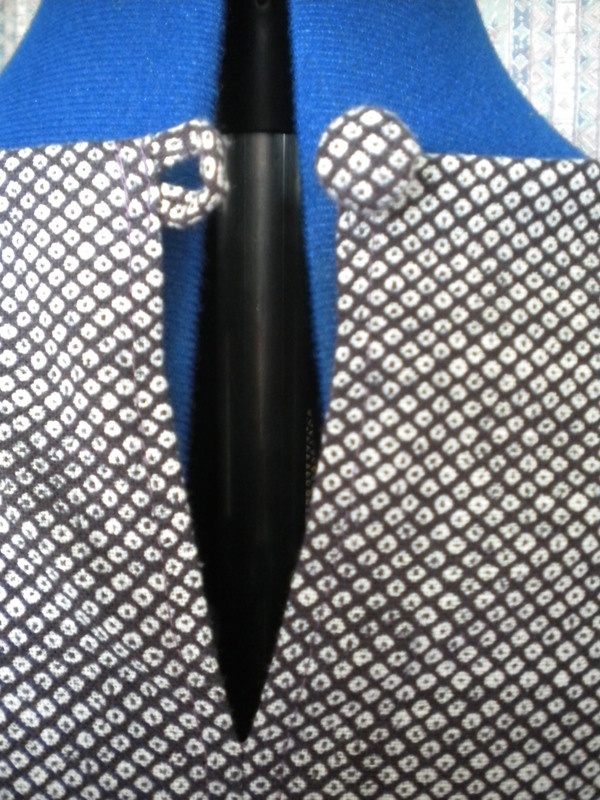 As I have done with tunics before, I decided to make a dress, adding 3 cm to the length. I also didn’t want the distinctive A- line of the original design, so I scaled down a size between the waist and hem. Even then, I was concerned that it would be too big, so based on fitting the paper pattern to my dress form, I took another 1cm from each side seam, and therefore from the sleeves as well. So goodness knows what size I finished with, but the revised sizing did what I wanted it to do. The pattern – oh dear! I mean, its come together OK, but I thought there was a lot wrong with it. Its hard to know whether the missing marking – notches, grain lines, dots and so on were in the original, or whether they were lost somewhere during the printing process BUT…. there were a lot of markings missing. I was also very dubious about the fabric suggestion of 2m of 115cm without nap. It really didn’t look enough when it was cut, and it wasn’t. Luckily Guthrie-Ghani had enough left, but I used 2.9m altogether. So after a dash over to Moseley to buy more fabric, with a plan B up my, at that time, no existent, sleeves, I actually made most of the dress in about 1/2 day. Ah, yes, there aren’t only 5 pieces, as the magazine says. 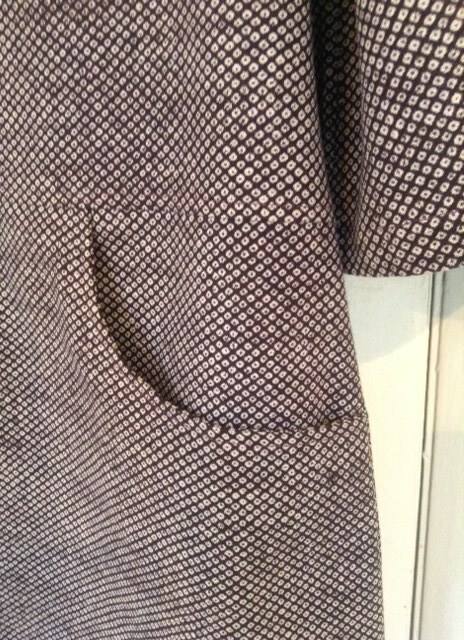 There are four pieces making up the front, three making up the back, and two pockets. It’s 100% cotton fabric, so it sewed up quite quickly, although I was quick to finish every seam on the overlocker, as it has a tendency to fray, It’s quite an open weave. All seams are carefully top stitched in such a similar colour thread that it is hard to see! There are 3 shades of this fabric, the purple one having been voted the most suited for me by Lauren, another customer, and myself, so that ‘s the one I bought, but plan B was to make the sleeves and pockets with a contrasting shade if the purple has run out. My favourite part was when I looked into the ever-useful button collection, and found that I had nothing suitable. That’s a rare event. But luckily I bought several sets of ready to cover buttons at the NEC, so used one of them to create a self covered button. I learnt a neat trick. If the fabric circle is moving around a bit and preventing you from fixing the button back in place, moisten the fabric, and it will stick to the button face! Marvellous. And here it is with a matching rouleaux loop. Despite my dissatisfaction with the pattern itself, the garment was straight off the pressing board, and onto me, as it is just right for this in-between time of year, and good for both work and leisure. You will see it feature again in Me Made May. Oh I was hoping to make this in a denim! Thanks for the tips! It does look gorgeous though! 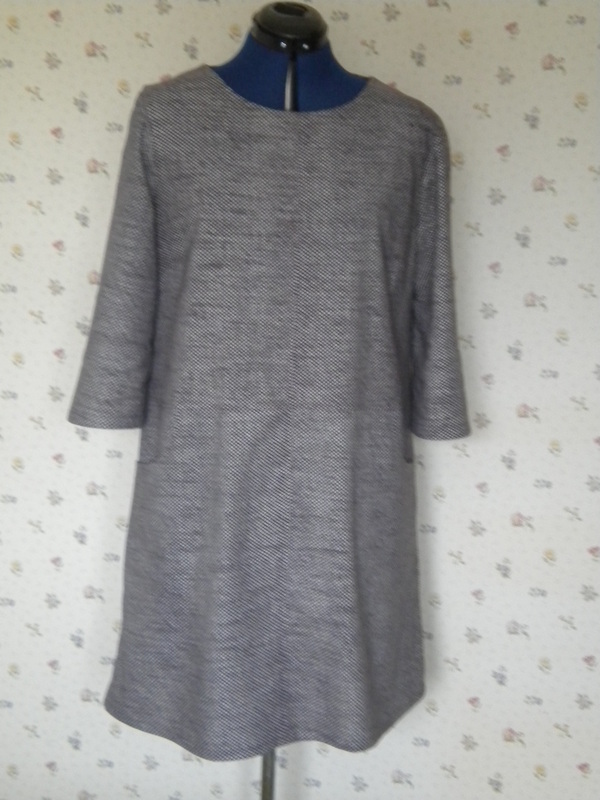 This entry was posted on May 10, 2015 by ann hebden in Dresses, Fashion, Love Sewing, Sewing, Tunic and tagged Dress, Fashion, Handmade, Love Sewing, Tunic.